As China's ruling Communist Party prepares to hand power to a new generation of leaders, the BBC Beijing Bureau explains why changes at the top of the armed forces are also being closely watched. China is ushering in a new generation of political leaders this week, as Communist Party leader Hu Jintao hands over power to successor Xi Jinping. At the same time, a new group will take over the armed forces. Amid a wave of retirements, at least seven new members will join China's 11-member Central Military Commission (CMC), which oversees its armed forces - including the world's largest standing army. 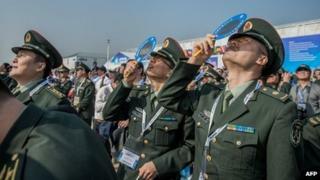 The new generals will assume power at a particularly sensitive time for the Chinese military. China's armed forces swear allegiance to the party rather than the country, and the CMC cannot take unilateral military action. But the commission's generals wield power by whispering their opinions in the ear of the Chinese leadership. "Influence from CMC members will be a major factor in determining whether there is peace or conflict in the region," explains Professor Denny Roy from the East-West Centre in Hawaii. "This matters now more than ever because there are so many regional issues that are on a knife-edge between stability and hostilities - the South China Sea, the East China Sea, North-South Korea tensions, the future of Taiwan, and the possibility of incidents between US and Chinese naval and air forces." It has become a political parlour game in Beijing to guess whether Hu Jintao will cling to his spot as the CMC chairman for two more years, like his predecessor, Jiang Zemin. If he does stay on, it could lead to tensions with Mr Xi, and even rivalries within the top ranks. Those in the know are also eager to find out which generals will nab the open spots on the CMC. Early signs indicate the CMC's members have already been decided, though the final list of members has yet to be announced. However, trying to guess what is going on behind the scenes in China's military handover is "like looking into a black box", complains Zhu Feng, deputy director at Peking University's School of International Studies. No matter who makes the final cut, however, the new generation of CMC members will differ from the previous generation in terms of life and military experience, explains Bo Zhiyue, senior fellow at the National University of Singapore's East Asian Institute. Unlike their predecessors, the new CMC members did not join the military as revolutionaries, but as professional soldiers. "Their main goal is military effectiveness as opposed to being concerned with politics and ideology," says Prof Roy. Due to the CMC's retirement age guidelines, all of the incoming members will probably have been born in the 1950s and probably joined the People's Liberation Army in the late 1960s, during China's tumultuous Cultural Revolution. However, the incoming generals were too young to have any direct experience in battle. Only one probable member of the new CMC - General Zhang Youxia - served as a low-ranking soldier during China's 1979 war with Vietnam. That lack of time in the trenches could make a big difference in the CMC's outlook. "Some analysts believe the lack of fighting experience might breed overconfidence, which could leave the PRC more likely to take risky and confrontational actions that force opponents to fight or back down," explains Professor Roy. Indeed, Bo Zhiyue says the new CMC will need to boost the Chinese military's modernisation drive - transforming it from a 2.3-million soldier standing army to sophisticated naval and air forces commanding advanced hardware, including at least one Chinese-made aircraft carrier, fighter jets and nuclear submarines. Flashy technology aside, the CMC's generals must also embrace the demands of modern military diplomacy. Only one of the expected incoming members - General Ma Xiaotian - has significant past experience of dealing with foreign military diplomacy, explains Bo Zhiyue. All of the others will have to learn how to interact with their foreign counterparts if they hope to keep peace in the region. "Ultimately, the army is prepared for war," he says. "However, if you can solve your conflicts with neighbours or potential rivals through diplomacy, that's even better."